1Department of Laboratory Medicine, College of Medicine, The Catholic University of Korea, Seoul, Korea. 2Division of Hematology, Department of Internal Medicine, Catholic Blood and Marrow Transplantation Center, Leukemia Research Institute, Seoul St. Mary's Hospital, College of Medicine, The Catholic University of Korea, Seoul, Korea. Received: December 29, 2017; Revised: February 9, 2018; Accepted: May 10, 2018; Published online: December 17, 2018. TO THE EDITOR: Sickle cell disease (SCD), a group of inherited red cell disorders, results from the presence of at least one abnormal sickle hemoglobin (HbS) allele. Vaso-occlusive complications in multiple organs and tissues, and hemolytic anemia are the main features of SCD . Management of acute and chronic complications of SCD includes red blood cell (RBC) transfusion and red cell exchange (RCE) by manual or automated methods . Acute RCE is used to treat severe or life-threatening complications of SCD including acute stroke, acute chest syndrome, multiorgan failure, severe intrahepatic cholestasis, and priapism. Chronic RCE is used to prevent either new or recurrent adverse events or progression of preexisting organ dysfunction, and this treatment is particularly indicated for stroke prophylaxis with prevention of iron overload, as well as for vaso-occlusive pain, pulmonary hypertension, and end-stage renal disease . RCE is also performed as part of the preparative regimen for nonmyeloablative allogeneic hematopoietic stem cell transplantation (HSCT) . To the best of our knowledge, there are no reports on Korean patients with SCD; however, the number of international patients visiting Korean hospitals has increased recently, and clinicians should be prepared to treat rare diseases like SCD. Therefore, we report our experiences with successful RCE in three Emirati patients with SCD using an apheresis instrument, Spectra Optia (version 7.0, TerumoBCT, Lakewood, CO, USA), prior to allogeneic HSCT. In all 3 cases, RCE was performed for prophylactic purposes prior to HSCT. A 26-year-old Emirati woman diagnosed with sickle cell anemia (SCA) in the United Arab Emirates (UAE) was admitted for allogeneic HSCT. According to her medical records from the UAE, she had a history of frequent admissions owing to sickle cell crisis, and had undergone a single RCE procedure in her country (Table 1). Her physical examination and laboratory data on admission are shown in Table 1. Her blood type was B+. The HbS level estimated by Hb electrophoresis (EP) was 70.8% of total Hb. HBB gene sequencing showed homozygosity of a known missense mutation (c.20A>T, p.Glu7Val) corresponding to sickle cell anemia (HbSS) . She did not receive RBC transfusion prior to RCE during her time at our hospital. Three automated RCE procedures were performed every other day. We calculated the total blood volume of the patient using the her gender, weight, and height (by Nadler's method) and estimated the patient's red cell volume using total blood volume and each pre-exchange hematocrit (Hct). The target FCR (%, fraction of cells remaining=HbS after exchange ×100/HbS before exchange) at the end of the procedure (35%), desired final Hct (30±3%), Hct of the replacement RBC units (70%), and inlet/outlet fluid balance (100%) were used to determine the replacement volume (RV), using the built-in formulae on our apheresis instruments. RV was divided by 250 mL to decide the number of packed RBC units (7, 7, and 8 units, respectively). All RBC components were ABO-identical (B+) and leukocyte-filtered. Therapeutic apheresis including RCE requires excellent vascular access to achieve adequate flow rates. Peripheral access is preferred and generally requires at least a 17-gauge needle for blood withdrawal and at least an 18-gauge catheter for return. Patients without adequate peripheral veins may require placement of a central vascular catheter . In this case, a central catheter was used for vascular access because the patient's peripheral veins were not adequate. Inlet blood flow rate was between 30 and 35 mL/min and ACD-A anticoagulant was infused at a ratio of 1:13–1:15 (Table 2). The blood flow rate was selected to achieve a procedure length of 2–3 hours, a generally accepted period of time. In general, the higher the anticoagulation ratio (AC ratio) (>1:15), the less citrate anticoagulant is present in the circuit. A higher AC ratio favors the development of platelet clumping and interface instability. The lower the AC ratio (<1:10), the greater the concentration of anticoagulant delivered to the patient, which can increase symptoms of citrate toxicity . Our patient tolerated the treatment well, and experienced no adverse reactions during any procedure. No irregular antibodies to RBCs were detected before or after RCEs. All Hct levels after each RCE were within the target Hct range (28.8%, 31.0%, and 27.7%, respectively); HbS level was 3.5% on the day after the last RCE (Fig. 1). Nonmyeloablative allogeneic HSCT  was performed nine days after last RCE, and level of HbS was 11.6% on the morning of the day of HSCT procedure. A 33-year-old Emirati man diagnosed with SCA in the UAE was admitted for allogeneic HSCT. According to his medical records from the UAE, he experienced frequent sickling crisis rashes with acute chest syndrome (Table 1), was admitted with painful crises and had undergone regular RCEs (Table 1). His physical examination and laboratory data on admission are shown in Table 1. His blood type was B+. HbS level was 64.5% and HBB gene mutation analysis demonstrated a homozygotic missense mutation, c.20A>T (p.Glu7Val). He did not receive RBC transfusion prior to RCE at our hospital. RCEs were performed twice before HSCT, every other day. The parameter settings for estimating RV were nearly the same as those in the previous case. Rh antigen (D, C, c, E and e)-matched packed RBCs were selected for replacement not in the first RCE but in the second RCE. Peripheral lines were used for vascular access in the first exchange, and a central line was used for the second procedure. Inlet blood flow rate was between 40 and 45 mL/min, and ACD-A anticoagulant was infused at a ratio of 1:13–1:15 (Table 2). Urticaria appeared during first procedure, but quickly resolved following anti-histamine medication administration. No irregular antibodies to RBCs were detected before or after the RCE procedures. All Hct levels after each RCE were within target Hct range (28.0% and 28.4%, respectively); HbS level was 3.8% on the day after the final RCE (Fig. 1). Nonmyeloablative allogeneic HSCT was performed eight days after the last RCE, but the HbS level was not tested immediately before HSCT. A 26-year-old Emirati woman diagnosed with SCD in the UAE was admitted for allogeneic HSCT. 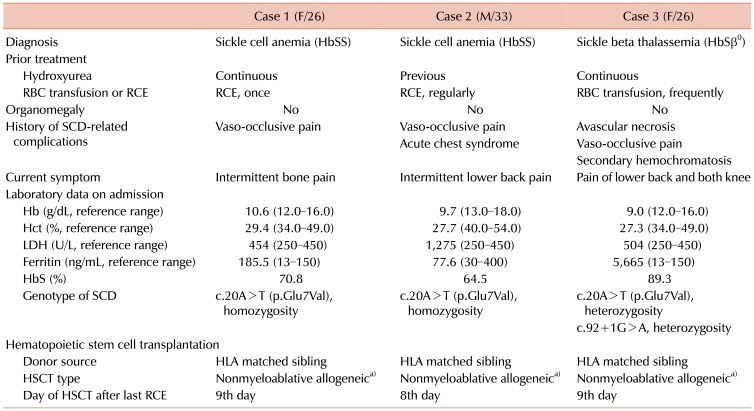 According to her medical records from the UAE, she had a history of SCD-related complications including recurrent pain crisis and avascular necrosis of the left hip (Table 1). Her physical examination and laboratory data on admission are shown in Table 1. Her blood type was O+. HbS level was 89.3% of total Hb. In HBB gene mutation analysis, heterozygosity of beta-globin gene mutations was found as a known missense mutation, c.20A>T (p.Glu7Val) corresponding to sickle cell anemia and a known splicing site mutation in intron 1 (c.92+1G>A) corresponding to beta-thalassemia . The final diagnosis was sickle-beta-thalassemia (HbSβ0) with known mutations in the HBB gene . She did not receive RBC transfusion prior to RCE during her stay in our hospital. RCEs were performed twice before HSCT on two consecutive days. RV was estimated using the same method as that used with the previous patient. Six units of ABO-identical (O+), leukocyte-filtered, and Rh antigen (D, C, c, E and e)-matched packed RBCs were selected for replacement. Vascular access required both peripheral (return) and central (access) lines. Inlet blood flow rate was 25 mL/min, and ACD-A anticoagulant was infused at a ratio of 1:13–1:15 (Table 2). All procedures were tolerated. Alloantibodies such as anti-Kpa and anti-E (only detected with enzyme-treated reagent cells) were weakly detected prior to RCE, but no new onset alloantibodies were detected after the procedures. All Hct levels after each RCE were within the target Hct range (32.7% and 31.5%, respectively). HbS levels were 4.3% on the day after the final RCE (Fig. 1). Nonmyeloablative allogeneic HSCT was performed 9 days after the last RCE, but the HbS level was not estimated immediately prior to HSCT. RBC transfusion and RCE are among the main therapeutic modalities for both acute and chronic complications related to SCD, although allogeneic HSCT is considered a potentially curative therapy for SCD patients . Although simple RBC transfusion is easy to perform, automated RCE is shown to be efficient in reducing sickle cells without complications such as increasing a patient's blood volume and viscosity, and causing iron overload . According to the American Society for Apheresis (ASFA) , general guidelines for RCE in patients with SCD are end Hct of 30±3% to avoid hyperviscosity and HbS of 30% (or HbS+HbC of 30%). In adult patients with SCD, in preparation for non-myeloablative allogeneic HSCT, it is recommended that RCE be performed to reduce HbS levels to 30% or less . In the present study, final HbS levels in all 3 patients were less than 10% after 2 or 3 RCE procedures, demonstrating successful achievement of the target goal. Most patients with SCD require chronic RBC transfusion, and thus are at high risk of alloimmunization. In patients with SCD, alloantibodies to the Rhesus system and to the K antigen account for over two-thirds of the RBC antibodies encountered in all populations studied. Alloantibodies to antigens in the Kidd, Duffy, Lewis, and MNS systems are also frequently formed in these patients. Anti-Lewis antibodies are usually clinically insignificant; however, the remaining antibodies formed by patients with SCD can potentially lead to hemolytic transfusion reactions and delays in finding compatible RBC units . Therefore, ABO, full Rhesus (D, C/c, E/e), and Kell antigen-matched blood should be recommended to prevent RBC alloimmunization . The RBC unit, which is HbS negative, leukocyte-reduced, and antigen-matched (C, c, E, e, K), is presented because long-term blood donor exposure can potentially increase the risk of infectious transmission and RBC alloimmunization . We used ABO-identical and leukocyte-filtered RBC units for replacement in all 3 cases. RBC units with full Rhesus antigen matching (with the exception of the K antigen) were used in the second RCE in Case 2 and all RCEs in Case 3. The Rhesus phenotypes of RBC units were provided by blood centers. Because the prevalence of the K antigen is extremely low in the Korean population , selection of replacement red cells without K antigen matching is not important. Our patients showed no evidence of new-onset RBC alloantibodies, and all successfully underwent HSCT. In Korea, the medical benefits of phenotyping of Rhesus systems (C/c and E/e) and other blood groups including Kidd and Duffy have limited application. The Korean Health Insurance Review and Assessment Service provides medical care benefits only for phenotyping hemolytic anemia patients with already formed alloantibodies and for phenotyping RBC units to find compatible units for these patients. This narrow extent of medical care benefits cannot cover phenotyping for prevention of RBC alloimmunization. Although Rhesus phenotypes (C/c and E/e) of RBC components were provided by blood centers including the Korean Red Cross and Hanmaum Blood Center, they recommend that the Rhesus phenotypes be confirmed in clinical laboratories when RBC units are issued for Rhesus-compatible transfusions. It has been reported that exact matching of RBC antigens including ABO, Rh, Kell, Kidd, and Duffy for transfusions in patients with SCD reduces the extent and rate of alloimmunization, providing safer transfusions in a timely fashion, and should be considered whenever such patients are transfused . Therefore, expanding criteria for blood group phenotyping is necessary to prevent RBC alloimmunization in patients likely to receive chronic transfusions, including patients with SCD. To our knowledge, there are no reported cases of SCD in the Korean population, and there is only one case report of HbSβ0 thalassemia patient from Tunisia receiving prophylactic RCE in Korea before traveling back . Unlike in the previous report, we used RBC components with full Rhesus antigen-matching, which was found to be helpful in preventing RBC alloimmunization. In addition, all RCEs were performed as part of a preparative protocol for non-myeloablative allogeneic HSCT in patients with SCD. Therefore, this report will be helpful as more foreign patients come to Korea to undergo HSCT for the same reasons. In 2016, more than 2 million foreign residents including foreign workers, students, and intermarriage immigrants were living in Korea, constituting about 3.96% of the total population . As the number of foreigners increase annually, the need for understanding and managing a variety of diseases including SCD also increases. In this study, we report the cases of three Emirati patients with SCD who received successful RCE using the Spectra Optia system (TerumoBCT) for reduction of HbS prior to nonmyeloablative allogeneic HSCT. Our experiences demonstrate that automated RCE is an effective and safe therapeutic modality for rapid reduction of pathologic HbS in SCD patients over a short period. Change of hemoglobin S (green bars) and Hct (red lines) levels of 3 SCD cases according to red cell exchange (black arrows). Abbereviations: HbS, hemoglobin S; Hct, hematocrit; SCD, sickle cell disease; RCE, red cell exchange. Clinical characteristics of 3 patients with sickle cell disease. a)Nonmyeloablative allogeneic HSCTs were performed according to reference . Abbreviations: Hb, hemoglobin; HCST, hematopoietic stem cell transplantation; Hct, hematocrit; HLA, human leukocyte antigen; LDH, lactate dehydrogenase; RBC, red blood cell; SCD, sickle cell disease; RCE, red cell exchange. Profiles of red cell exchange performed on 3 patients with sickle cell disease. Abbreviations: FCR, fraction of cells remaining; Hct, hematocrit; HSCT, hematopoietic stem cell transplantation; RBC, red blood cell; RCE, red cell exchange; TBV, total blood volume. Rees DC, Williams TN, Gladwin MT. Sickle-cell disease. Lancet 2010;376:2018-2031. Schwartz J, Padmanabhan A, Aqui N, et al. Guidelines on the use of therapeutic apheresis in clinical practice-evidence-based approach from the Writing Committee of the American Society for Apheresis: the seventh special issue. J Clin Apher 2016;31:149-162. Kim HC. Red cell exchange: special focus on sickle cell disease. Hematology Am Soc Hematol Educ Program 2014;2014:450-456. Hsieh MM, Fitzhugh CD, Weitzel RP, et al. Nonmyeloablative HLA-matched sibling allogeneic hematopoietic stem cell transplantation for severe sickle cell phenotype. JAMA 2014;312:48-56. Engelke DR, Hoener PA, Collins FS. Direct sequencing of enzymatically amplified human genomic DNA. Proc Natl Acad Sci U S A 1988;85:544-548. Fung MK, Eder AF, Spitalnik SL, Westhoff CM. Technical manual. 19th ed. Bethesda, MD: American Assnociation of Blood Banks; 2017. p. 645-646. Lee G, Arepally GM. Anticoagulation techniques in apheresis: from heparin to citrate and beyond. J Clin Apher 2012;27:117-125. Papachatzopoulou A, Kourakli A, Stavrou EF, et al. Region-specific genetic heterogeneity of HBB mutation distribution in South-Western Greece. Hemoglobin 2010;34:333-342. Hsieh MM, Kang EM, Fitzhugh CD, et al. Allogeneic hematopoietic stem-cell transplantation for sickle cell disease. N Engl J Med 2009;361:2309-2317. Vichinsky EP, Earles A, Johnson RA, Hoag MS, Williams A, Lubin B. Alloimmunization in sickle cell anemia and transfusion of racially unmatched blood. N Engl J Med 1990;322:1617-1621. Chae SL, Cho HI, Kim SI. A study on the frequencies of U, Diegoa, and Kell blood group antigens and anti-Dia and anti-K in Koreans. Korean J Blood Hematol 1988;23:183-188. Lasalle-Williams M, Nuss R, Le T, et al. Extended red blood cell antigen matching for transfusions in sickle cell disease: a review of a 14-year experience from a single center (CME). Transfusion 2011;51:1732-1739. Choi R, Song J, Jung HK, et al. A case of red blood cell exchange transfsuion in a patient with hemoglobin S/β-thalassemia. Korean J Blood Transfus 2012;23:256-261.